Impacts, what can they be and how to utilize them. Hello to readers that has followed med from the previous blogs and of course to all new readers in this blog. I am one of the founders of the company that has made the concept and developed the NoLimit-app. We are proud to see developing and getting new users every day. and sacrifices of the elements that does not take towards your goal or might even pull you away from your goal. The latter is what we in the app have defined impacts, and I hope to give you a good understanding of the concept of impacts through this blog. 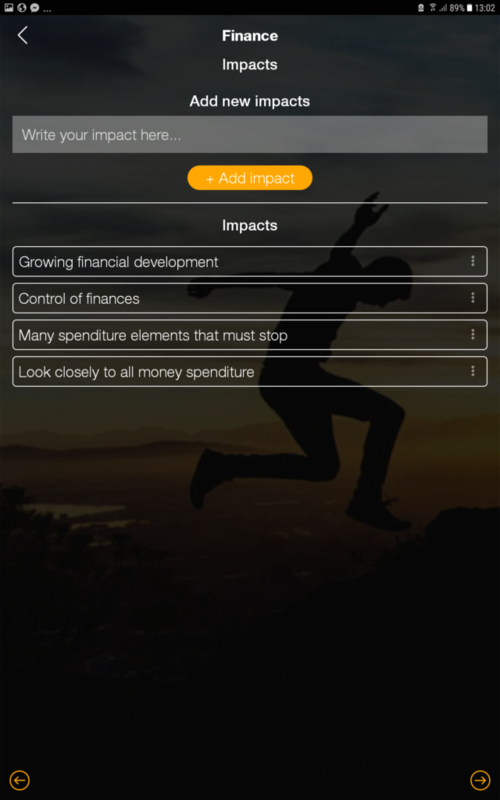 In the NoLimit-app – Goal setting app, impacts have a double function. The first function relates to impacts of the tasks you do on your journey to your goal. The second function relates to the output you get when you have reached your goal, the output can even be seen as outcome. If we were to split impacts in two it would be sacrifices underway and benefits afterwards. We do not want to split this in two parts. 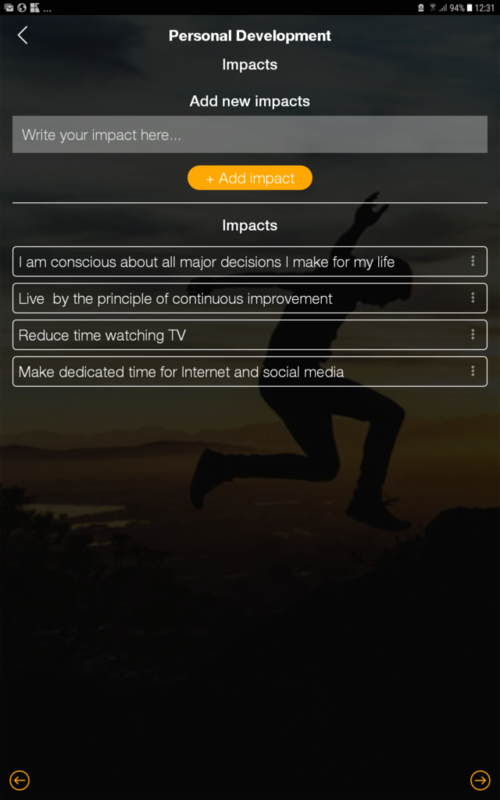 When I look at the impacts function of the app one part should identify how reaching my goal will impact my life, and it should be positive impacts. The second part of milestones I defined in the app for my goal was the immediate milestones for starting the journey towards my goal from where I currently stand. This will also identify impacts, but this is impacts that occurs on the path to my goal and in the short run they might not feel like positive impacts in the beginning. The reason why these impacts might feel difficult is because it is the actual changes you must do in your life to reach your goal. There are no set rules to how you identify and work with your impacts but I strongly advice that you follow the structure from your previous work. For my usage of the app you might remember from previous blogs that I defined a goal “to live a life I am proud of” which should be reach at the end of 2018. I then looked into what this mean in the six areas of the app and I defined several milestones to control in December 2018. Reaching those milestones indicate that I will manage to reach my goals. The impacts underway will be seen as ‘negative’ due to the fact that they are results of required habit improvements. To reduce weight you will have to become more physical active and one impact can be less time in your favourite chair in front of the TV watching shows you really like. Another impact can be not using elevators for less than four stories and it can be cycling to the store rather than car or subway. One possible impact can be to not sit with friends at a café/restaurant/bar three times every week but rather go for a run or to the gym those days. Increase amount of vegetables to become 75% of your plate (vegetables contain calories that require substantial energy to digest, compare to processed food that contain high level of empty calories). The common denominator for all these impacts is a change of habits and most of them will push you out of your comfort zone, we like it in our comfort zone – that’s why we call it comfort. If we look at the other impacts, those that occur when we have reached this part of the goal it is a totally different story. 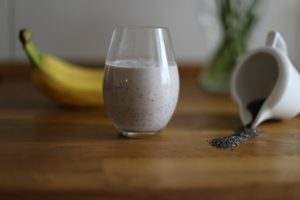 We have reached our weight goal and the following will probably some of the impacts: we experience higher level of energy due to physical activities over time and healthier food, we feel that we can accomplish more with friends and family because we are more agile and in better physical shape. improved feeling about ourselves is another feasible impact along with personal growth and we will probably believe more in ourselves. The first impacts are those necessary for us to identify so that we need what this will require while we undergo the transfer towards our goal while the second impacts are the improved output when we have reached our goal. It is about time to relate this to my personal journey – to become a better you. My strategy is to identify the positive impacts that will occur when I reach my goal first, the reason for this is that I believe it make it easier to accept the impacts on my way when I have a good understanding of the end situation. The major impact in the personal development of achieving my goal, To live a life I am proud of, is that I will be conscious about the major decisions I make for my life. I will live more in the way of continuous improvement, which is a life-long learning process. For the journey to my goal it will require that I sacrifice several elements that currently keep me in the comfort zone, like watching TV for several hours every day. These hours should be spent on things I later can look back at and think: “that was a good choice over TV”. The same goes for using internet for news and social media reading, I do not need to check newspapers, Facebook or twitter every ten minutes to see what has happened. For my family, the impact will be that we have better understanding and respect for our choices, we will gain better understanding about our boundaries. On the way to achieve this there will most probably be challenging situations that will require difficult conversations and though choices to make. Financially there will be some impacts as well. When I have achieved my goal, there will be a steady financial growth and I will have control over my finances. During the path to my goal there will be some impacts that’s aren’t so good when I have to look really close at all my spenditure to get an overview and furthermore there are several expenses that must be eliminated or dramatically reduced. In the friend’s section I will gain knowledge of my true friends and thus spend time with people that are important to me. To achieve this I must go through my friends base and probably cut the line with some of them. In the career part I am actually quite lucky because the impact of achieving my goal will be that I work with something that’s make me happy every day. I went through the process of identifying this some years ago and the work I do now is the correct thing for me to do; strive to build systems that help other people achieve more in their life. My health will be improved when I have achieved my goal, which is a really good thing. The path requires sacrifices of things I enjoy but are unhealthy and I must be able to push myself out of my comfort zone quite often. So, there you are with the impacts I have found for my goal at this stage. By this stage you have probably realized that the things we put into this system is not carved in stone and will be changed/improved when we move on our path to our goal.The work we are doing here is a tidies process, but I know from earlier experiences that it is totally worth the effort when we reach our goals. Best of luck with your path and I hope you stay with me, the next blog will introduce how I use two of the tools that are present in the NoLimit-app – Best Goal tracking app.